TALK ABOUT A MONSTER PARTY!! Tokyo on Christmas day was the place to be and we were there. 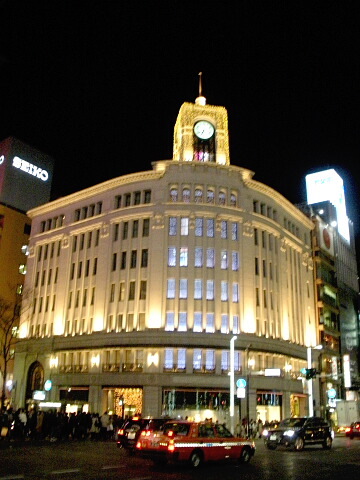 The Ginza Star Hall directly across the street from the Wako Department store was the site of a private party for Japanese Giant Monster Fans. 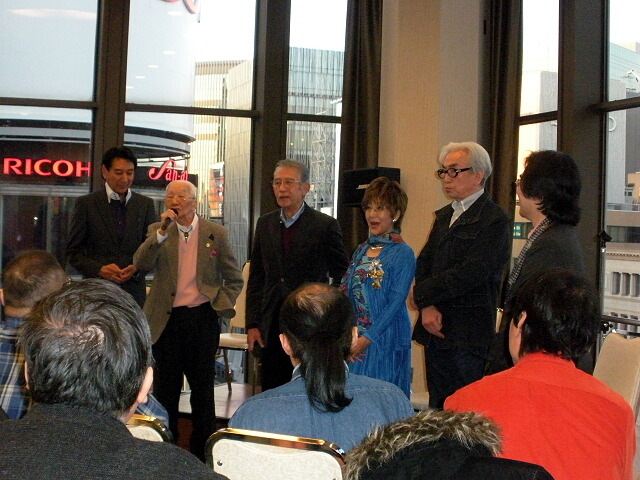 The special guests were some of the most beloved members of the cast and crew of Toho and Tsuburaya Tokusatsu films and TV shows: Koizumi, Hiroshi the star of Godzilla’s Counter Attack 1955 and Mothra, Matango and Tokyo SOS; Tsuchiya, Yoshio star of Destroy All Monsters, Invasion of the Astro Monster and many Kurosawa films; Takarada, Akira star of the original 1954 Godzilla, Mothra, Half Human and Godzilla Final Wars; Sahara, Kenji star of Rodan, the H-Man, Destroy All Monsters and Ultraman; Kobayashi, Yukiko star of Destroy All Monsters and Yog; Nakano, Teruyoshi Special Effects Director for Tsuburaya and Toho; Kajita, Kojii Assistant Director on many Toho Giant Monster Movies going back to the early years; and Bin Furuya suit actor for Ultraman and General Takamine in the new Guilala movie. 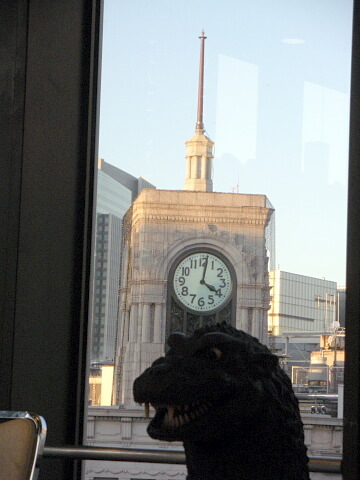 The party site on the 9th floor looking directly at the Wako Department store tower was extremely fitting since it is part of an iconic scene in the first Godzilla movie. Each guest told of memorable moments in their careers. Some of the stories were funny; some were poignant. 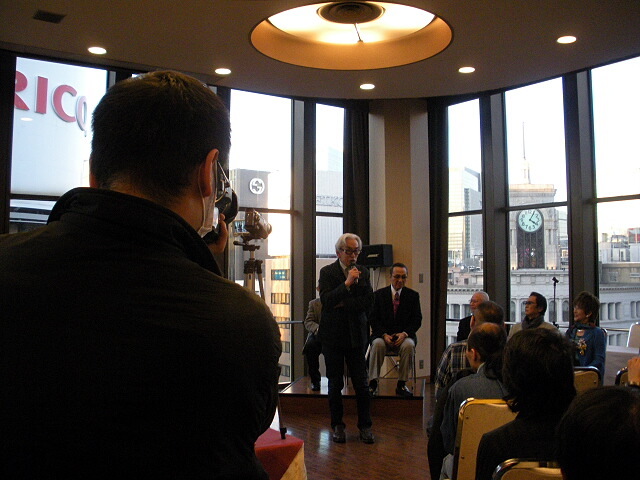 Mr. Kajita who was the eldest of the special guests had so many stories from the multitude of movies on which he has worked. Mr. Koizumi, still handsome and dignified at 84 was vibrant. Mr. Takarada the ever professional showman was charming and elegant. 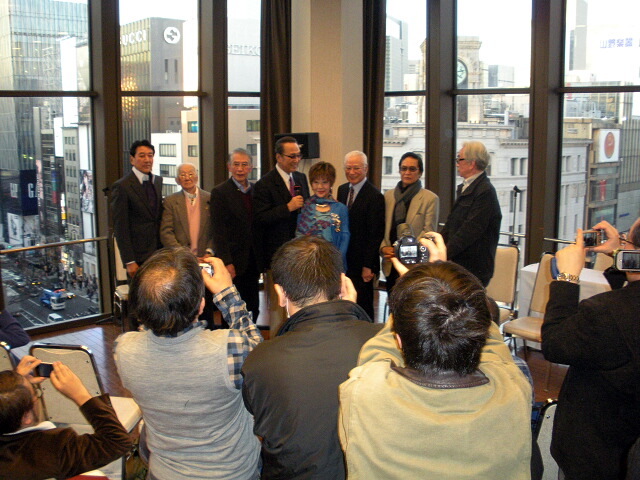 Ms. Kobayashi looked charmingly radiant and happy to see her fans. Mr. Nakano, always personable and friendly was excited and talkative. Mr. Sahara seemed reserved yet glad to see some of his many fans. Mr. Tsuchiya exuded the commanding presence which was his trademark in many films. Mr. Furuya who played the first Ultraman cut an elegant figure with his still slender and agile physique. The attendees who were limited to 40 or so people were enthusiastic and happy for the chance to meet with so many film professionals. There was time for autograph sessions and a buffet afterward. These actors and production members make up some of the most important history in Japanese Tokusatsu movies. 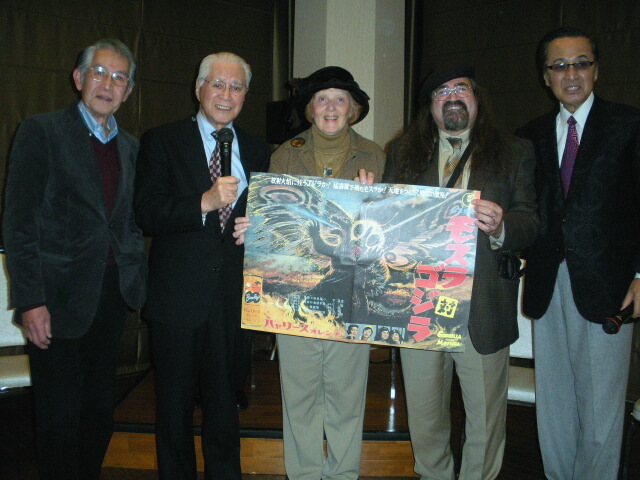 We felt privileged to be in the presence of those who made monster magic during the heyday of Japanese Science Fiction Cinema. Special thanks go to lovely and always energetic Shegeko-san, for the kind and extremely knowledgeable Dr. Abbey and all of the Japanese Fan Club for allowing us to be a small part of such a wonderful GODZILLA CHRISTMAS!